16 pairs of male and female professional Go players who represent the Japanese Go world will play tournament games, and in the 4th round, the winning pair will be decided. Games from the 1st round to the semifinal round will be played at the Nihon Ki-in on February 9, and the final game will be played at the Nihon Ki-in on March 3. This year’s European Go Congress was held in Pisa, Italy and it broke a record in number of participants as there were almost 1.500 players who took part in the events organized during july 27th and august 12th at Congress Palace. 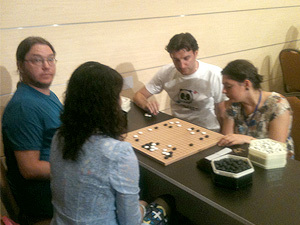 Pandanet is broadcasting two games per day from the European Go Congress in Pisa, Italy, July 31 – August 12. The games are starting at 10am CET. Welcome to watch! 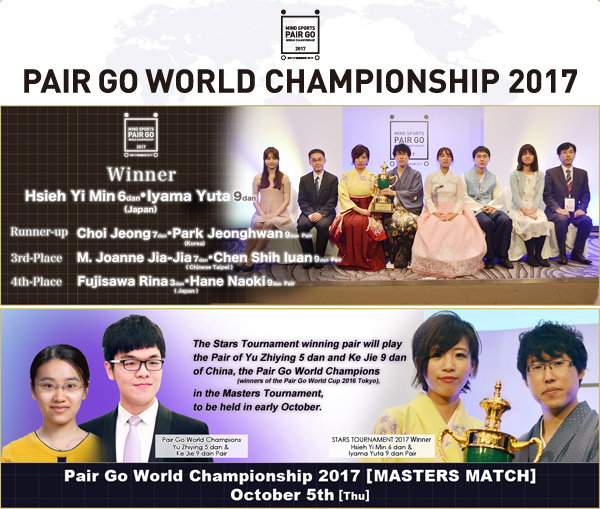 16 pairs of male and female professional Go players who represent the Japanese Go world will play tournament games, and in the 4th round, the winning pair will be decided. 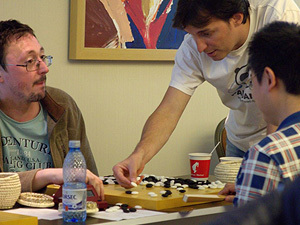 Games from the 1st round to the semifinal round will be played at the Nihon Ki-in on February 10, and the final game will be played at the Nihon Ki-in on March 4. The human pair (Yimin&Iyama and Yu&Ke) can discuss freely and we consider them as one person. You can use it to practise a nice collection of Life & Death problems. There are always new collections which you can purchase using the internal Panda Coins currency. The app also features Panda Sensei, an AI which can solve any custom Life & Death situation for you better than top pros! The position just has to be contained to a closed region. Please try it out for sourself! The 2017 edition of the WAGC was held in Sheraton Hotel in the city of Guiyang in southern China from June 4th till June 7th and it had 50 countries registered but only 48 competing for the World Go Champion title as Hungary and Madagascar didn’t make it to the event. 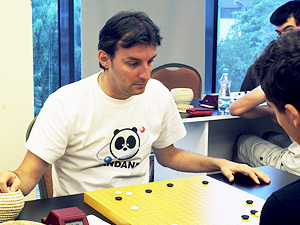 Pandanet is holding the Internet 13×13 Amateur World Go Championship. The winner in the Main class will earn the right to play a game with Hirofumi Ohashi 6-dan (13×13 Net game). The next Open European Pair Go Championship will be held at the EGC 2017 in Oberhof. The match for the 55th Judan title starts on March 7th. Defending champion is Iyama Yuta Judan and challenger is Yu Zheng Qi 7p The match is best of five games, so three wins are required to secure the title. 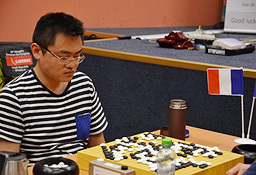 Yu Zheng Qi won, W+Resign. Iyama Yuta kept the Judan title! The match for the 64th Oza title starts on October 17th. Defending champion is Iyama Yuta Oza. and challenger is Yu Zheng Qi 7p. The match is best of five games, so three wins are required to secure the title. The first game: October 17 (Mon). The second game: November 7 (Mon). The third game: November 18 (Fri). The fourth game: December 8 (Thu). The fifth game: December 15 (Thu). The 71st Honinbo title is broadcast live on GoPanda2 client. The sixth game: July 5th (Tue) and 6th (Wed). The seventh game: July 14th (Thu) and 15th (Fri). 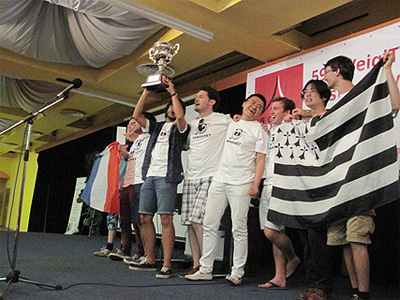 Co-organizer ： its communications Inc.
Pandanet is holding the world’s first Internet 13×13 Amateur World Go Championship. The winners will be presented with splendid prizes. The 4th China-Korea-Japan Professional Pair Go Championship will take place from 27-28 April 2016 in Anhui Province, China China. Pandanet will make reports from the games. Registration with gmail accounts should be working again. Time limit：2hour, 60 seconds, 3times. Defending champion is Iyama Yuta Gosei and challenger is Yamashita Keigo 9p. The time limit is four hours each. The first game: June 26th (Fri). Iyama Yuta won, B+Resign. The second game: July 20th (Mon). Yamahita Keigo won, B+Resign. The third game: July 27th (Mon). Iyama Yuta won, B+1.5. The fourth game: August 7th (Fri). Iyama Yuta won, W+Resign. The fifth game: August 29th (Sat). The 70th Honinbo title is broadcast live on GoPanda2 client. Champion is Iyama Yuta Honinbo. The challenger is Yamashita Keigo 9p. The match is best of seven games, so four wins are required to secure the title. The sixth game: July 7th (Tue) and 8th (Wed). The seventh game: July 14th (Tue) and 15th (Wed). The 36th World Amateur Go Championship will take place from June 6 – 10, 2015 in Bangkok, Thailand. The match for the 27th Women’s Meijin Title starts on March 5th. Defending champion is Shei Imin Women’s Meijin and challenger is Suzuki Ayumi 6p. The match is best of three games, so two wins are required to secure the title. The 1st game: March 4 (Wed). The 2nd game: March 11 (Wed). The 3rd game: March 18 (Mon). Shei Imin kept the Women’s Meijin title! All rounds starts at 9:30 (Japan Time), i.e., 2:30 CEST. The time limit is three hours each. Five-rounds of tournament style games will be played by 32 representative pairs from 21 overseas countries and territories, and 11 pairs selected from 8 domestic regions. The Go competition of the 4th SportAccord World Mind Games will take place from 11-17 December 2014 in Beijing, China. Pandanet will make reports from the games. 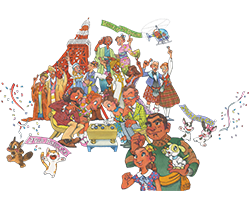 The 39th Gosei is being broadcast live on GoPanda2 client. The first game: June 26th (Thu). Kono Rin won, B+Resign. The second game: July 20th (Sun). Iyama Yuta won, B+Resign. The third game: August 11th (Mon). Iyama Yuta won, W+Resign. The fourth game: August 25th (Mon). Kono Rin won, W+Resign. The fifth game: August 29rd (Fri). Iyama Yuta won, W+Resign. The match for the 52nd Judan title starts on March 4th. Defending champion is Yuki Satoshi Judan and challenger is Takao Shinji 9p. The match is best of five games, so three wins are required to secure the title. The 1st game: March 4 (Tue). The 2nd game: March 27 (Thu). The 3rd game: April 10 (Thu). The 4th game: April 17 (Thu). The 5th game: April 21 (Mon). The match for the 26th Women’s Meijin Title starts on March 5th. Defending champion is Shei Imin Women’s Meijin and challenger is Kato Keiko 6p. The match is best of three games, so two wins are required to secure the title. The 1st game: March 5 (Wed). The 2nd game: March 12 (Wed). The 3rd game: March 24 (Mon). The Go competition of the 3rd SportAccord World Mind Games will take place from 11-18 December 2013 in Beijing, China. Pandanet will make reports from the games. will take place from November 24 – 26, 2013 in Shenzhen, China. All games are played without handicaps. TEMPORARILY, FOR THE DURATION OF THE TOURNAMENT, the participating players’ true ranks are not displayed. Instead, their ranks are unified in the tournament room as below. *This tournament serves as the 18th Pandanet Cup Internet World Amateur Go Tournament concurrently. The winner of the Final Rounds will receive an invitation to the 3rd SportAccord World Mind Games (a round-trip ticket to Beijing, accommodation, a commemorative medal and a certificate). There are also generous prizes by lottery! *People who hope to participate in A～C Class and have not been confirmed of their rank by Pandanet, need to play at least 20 games and be confirmed of their rank by August 18. If a question mark appears next to the rank, it means the rank has not been officially confirmed by Pandanet. People who hope to participate in A～C Class and have not been confirmed of their rank by Pandanet, need to play at least 20 games and be confirmed of their rank by August 18. If a question mark appears next to the rank, it means the rank has not been officially confirmed by Pandanet. Several players who have played six games or more at the Preliminary Rounds will receive a special present from SportAccord by lottery. The 3rd SportAccord World Mind Games Online Go Tournament Champion title will be awarded by SportAccord. Invitation to the 3rd SportAccord World Mind Games in Beijing (a round-trip ticket to Beijing , accommodation, a commemorative medal and a certificate) by SportAccord. The 18th Pandanet Cup Internet World Amateur Go Tournamentant Champion title will be awarded by Pandanet. Several players who have played six games or more at the Preliminary Round will receive a special present from SportAccord by lottery. The 38th Meijin title is broadcast live on GoPanda2 client. Champion is Yamashita Keigo Meijin. The challenger is Iyama Yuta Kisei. The match is best of seven games, so four wins are required to secure the title. 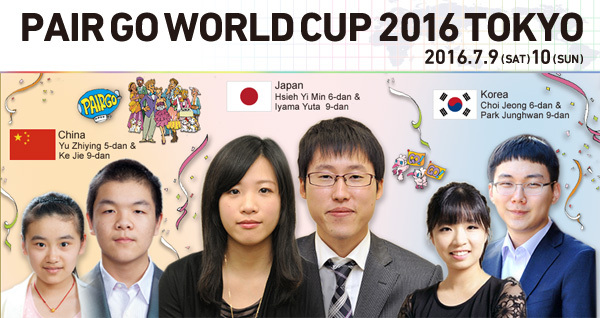 The Mijin tournament is organized by Asahi Newspaper Co., Ltd. The first game : September 5th (Thu) and 6th (Fri). The second game: September 19th (Thu) and 20th (Fri). The third game: September 25th (Wed) and 26th (Thu). The fourth game: October 9th (Wed) and 10th (Thu). The 34th World Amateur Go Championship will take place from September 1 – 4, 2013 in Sendai, Miyagi. Go competition of the 4th Asian Indoor & Martial Arts Games Incheon 2013 will take place from June 29 – July 6, 2013 in Incheon, Korea. The match for the 37th Meijin title is broadcast live on Pandanet-IGS, starting on August 30th. Defending champion is Yamashita Keigo Meijin and challenger is Hane Naoki. The match is best of seven games, so four wins are required to secure the title. The first game: Aug 30 (Thu) and Aug 31 (Fri). The second game: Sep 20 (Thu) and Sep 21 (Fri). The third game: Sep 27 (Thu) and Sep 28 (Fri). The forth game: Oct 10 (Wed) and Oct 11 (Thu). The fifth game: Oct 17 (Wed) and Oct 18 (Thu). The sixth game: Oct 31 (Wed) and Nov 1 (Thu). The seventh game: Nov 12 (Mon) and Nov 13 (Tue). Yamashita Keigo kept the title! The winner of the 17th Internet World Amateur Go Tournament 2012 was RAICHUU (Japan) Congratulations! 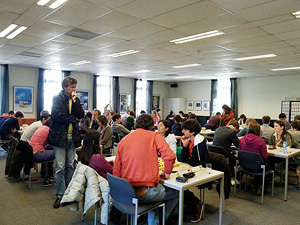 "Pandanet Go European Team Championship" "European Pair Go Tournament" in the "European Go Congress 2012 BONN" was held. "Youth-Adult Pair Go" "North American Pair Go Championship" in the "2012 US Go Congress North Carolina" was held. Pandanet-IGS will braodcast games from the European Pair Go Championship, which is played on the weekend 2nd to 3rd of June in Lyon. 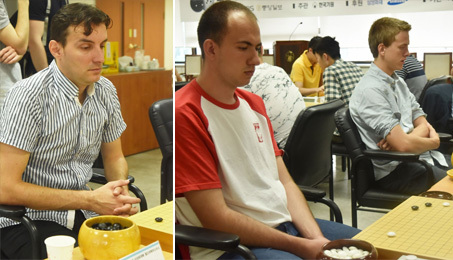 The top pair will be invited to the 23th International Amateur Pair Go Championship. You can now watch the progress of your rating on Pandanet-IGS on a rating graph. Note that a flash player is required. The match for the 59th Oza title starts on October 20th. Defending champion is Cho U Oza and challenger is Hane Naoki Gosei. The match is best of five games, so three wins are required to secure the title. The first game, Oct 20th(Thu): Cho U won, W+3.5. The second game, Nov 11th(Fri): Cho U won, B+1.5. 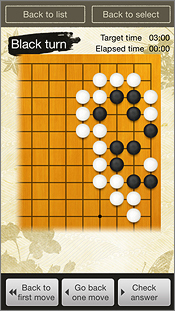 The third game, Nov 24th(Thu): Cho U won, W+Resign. 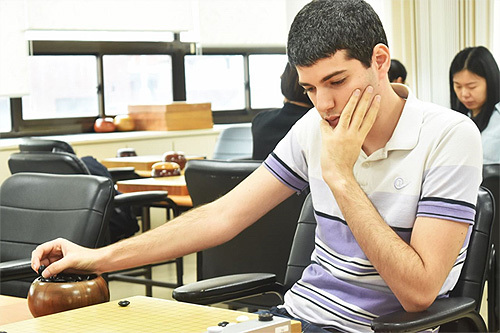 Cho U retained the title with a 3—0 victory. All funds will be transferred to the victims through the Chamber of Commerce and Industries Youth Section in the disaster prefectures. We offer our sincere thanks to everyone who supported our disaster donation. 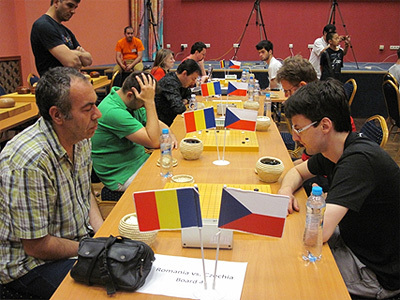 With 300 top players from 30 countries, the Pandanet Go European Team Championship is the strongest European tournament ever played. All the games are going to be played on IGS. To watch them, you just need to create an account on IGS , download GoPanda , and log on to IGS. Keep an eye on the schedule to make sure you don’t miss anything. The registration for the Pandanet Go European Tournament is now open. If you play in the tournament, please register as soon as possible. The Pandanet IGS Website is now open! 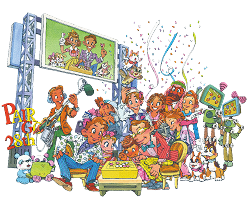 It is still being worked on, so check back frequently for updates.